Late summer has been a whirlwind of activity for Feather Communications. In August, we were fortunate to travel to Washington, DC. 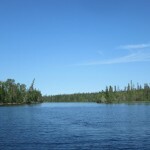 Then, two weeks later, we completed our annual week-long fishing trip to northern Ontario, Canada. August involved an equal amount of vacation and work time. And, it has been GREAT for business! Why? Going on a vacation allows you to rejuvenate, regenerate, and focus on what is really important in your life. It allows you to go back to your WHY – realizing why you have chosen this unique life of an entrepreneur. If you can’t take some time to enjoy the fruits of your labor, then why you are bothering with your career? First, a vacation enhances your performance. Because our bodies and minds need rest, time away from the office allows for some of this rest. Even though family vacations and group getaways can become hectic with busy schedules, they are still (typically) more relaxing than a day in the office. In addition, the time away from the office provides you with a fresh mind-set and perspective upon your return. Next, time outside of your normal routine can provide a venue for creativity. Without the standard desk, computer, and four walls of your office, you may find that new ideas come to you more clearly and you may see things that offer sparks of inspiration for future projects. Taking photos on your vacation and reviewing them at particular intervals can also provide chances for imagination to flourish and grow. Finally, unplugging from technology can help your mind reset. When we travel to Canada, approximately 12 hours north of our home, we are completely off-the-grid. While there is electricity at the cabin we rent, the electricity is strictly from a generator. And, although the main lodge does have Internet access, I choose to ignore that and simply enjoy the time away with my son, husband, and the wild wilderness of northern Canada. So, if you are even considering taking a vacation and are worried about your business, keep this in mind—a vacation may be just what your business needs to move forward with creativity, focus, and excitement for the future. 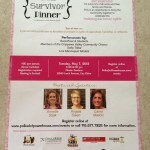 On May 7, Feather Communications will sponsor the 1st Annual Survivor Dinner presented by Polka Dot Powerhouse. This event, designed to celebrate the human spirit, is the first of its kind in the Chippewa Valley and promises to be an inspirational event. “I’m proud to be a sponsor of this dinner and look forward to meeting other survivors during the event,” Heather Rothbauer-Wanish, owner of Feather Communications, said. “Polka Dot Powerhouse has proven to be an inspirational, positive, and outgoing networking group that really concentrates on adding connections to people’s lives,” she continued. During the Survivor Dinner, attendees will have a chance to see visual art, hear spoken word, and shop at vendor booths. “While I’m excited to showcase my business during the event, I’m even more excited to share in the resiliency of the human spirit and make lasting connections,” Rothbauer-Wanish concluded. 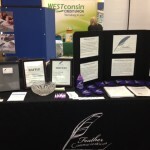 On Thursday, April 25, Feather Communications showcased its services at the 10th Annual Women’s Business Conference. The event, based in Eau Claire, featured local and regional businesses, speakers, seminars, and a variety of learning sessions. There were over 500 attendees at this year’s conference. Throughout the day, Feather Communications was able to meet with attendees and discuss services available to clients. In addition to showing business writing examples, Heather Rothbauer-Wanish was able to discuss resume-building, cover letters, and the writing process. “The event was a great success and I enjoyed connecting with attendees,” Rothbauer-Wanish said. “The Women’s Business Conference always has valuable informational sessions and wonderful ways to network with other business owners,” she continued. As any entrepreneur knows, networking can be the key to business success. Feather Communications is already looking forward to participating in next year’s event. “The Women’s Business Conference is a fantastic venue for local and regional business owners. We look forward to its continued success in the future,” Rothbauer-Wanish concluded. 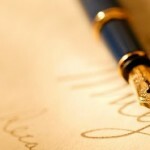 As a freelance writer through my business, Feather Communications, I am often asked, “How do you write?” Or, “I always find it so difficult to put my thoughts into words, what is your secret?” While I don’t know that there is a secret to writing success, I often turn to the writing process I learned years ago. The writing process is certainly no secret and many of us learned it in elementary school. However, as we get older, we concentrate so much on using the ‘right’ words, that we forget the important part of the process. First, a good writer does pre-writing. I consider this stage to be the research stage. Think about what you want to write about and jot some notes. This could be considered a mini-outline. While you are not writing during this stage, you are making notes and sketching out a practical way of organizing your information. A good example of pre-writing is what I do each month for the Menomonie Optimist Club Newsletter. I receive information throughout the month for this 4-page newsletter. I create a new file for each month’s newsletter. As I receive information, I save it in this file. Then, when I am ready to create the newsletter, I make a list of each item I have and determine the best way to incorporate it into the newsletter. This pre-writing stage saves me a great deal of time. If you do this when creating a longer document, I can help you work toward completing each section. These mini-goals will keep you motivated. The second stage of writing is the actual writing stage. This is probably the shortest stage. The mistake that many people make is trying to write the document perfectly during this stage. This is nearly impossible. When I write articles, newsletters, press releases, or other materials, my focus is writing the information and getting it ‘written.’ While it is nowhere near perfect at this time, that is okay. The last stage is revising and proofreading. This is the stage where a writer should spend most of his or her time. When writing for a client, I typically revise and proofread several times before I send the document for approval. During this stage, you can focus on using descriptive adjectives, exciting verbs, and specific words. This is the time to ensure you are saying what you want to say and you are saying it HOW you want to say it. When you have your next writing project, think about these stages. Remember that most of your time should be spent in the pre-writing and revising stages. The actually writing should be the shortest of the three stages. Take these tips and put them to use. After all, who doesn’t want to make the writing process easier? There are many articles that discuss the importance of ‘giving back’ to the community and volunteering time for worthy causes. Sometimes it is difficult to decide which organization to become involved in; furthermore, it seems like all non-profits are constantly seeking active, productive, and involved members. Much like others, I try to find an organization that fits my values, works with my schedule, and gives back in a meaningful way. When I was a senior in high school, I was honored as the Menomonie Optimist Club Youth of the Month. What did it mean to me at the time? It meant that I received a free breakfast for myself and my parents. It also meant that I received a beautiful plaque that is still housed in my cedar chest. While that was over 16 years ago, it stayed with me; albeit, in the back of my mind. Last spring, I was approached by a networking contact to join the Menomonie Optimist Club. In contemplating how this was going to fit into my schedule, I began to think back to that morning when I had received my free breakfast and a wooden plaque. It meant a great deal that a local community organization believed in me as a high school senior. And, now, it means a great deal to me that the organization asked me to become part of it. Now, as a member of the Menomonie Optimist Club, I see the area youth coming to the meetings each month and celebrating their futures. I think back to my morning at the meeting and realize that giving back has come full circle. Now, I have an opportunity to be on the contributing end of the organization and hope those students remember their mornings well into the future. As part of the Menomonie Optimist Club, I have taken on the responsibility of the monthly newsletter. This is my area of expertise. And, that is how giving back to the community should work; you should be able to use your talents to give back in a meaningful way. There are meetings I cannot make and activities that I can’t do because of my work schedule. The newsletter – that is something I can do. And, the newsletter is e-mailed to many people beyond the organization, increasing the exposure for Feather Communications. Giving back does come full circle. The circle may take 16 years (or longer) to complete itself. However, when it does, it will give you a gratifying feeling that cannot be taken away. I am consistently asked how I “get” new clients. For example, how have I had the opportunity to speak at local chambers of commerce events? How do I get new resume clients? And, how do I find businesses that need marketing, public relations, and writing assistance? The answer is simple: networking. First, starting a writing and speaking business can be an interesting endeavor. How do you get your name out there? How do you let people know that you are available for marketing and writing opportunities? And, probably most interesting of all, how do potential clients know that you are actually a good writer/marketer/public relations person? I started my business my writing articles and other small marketing pieces for local non-profit organizations. Obviously, these were volunteer assignments and I did not get paid. What did I get? I was able to secure numerous individuals that understood my diligent work ethic, timeliness when completing job assignments, and writing skills. These people were worth more to me than the monetary value I would have received if these jobs were paid. However, this networking started my business and continues it today. My business is a member of two local chambers of commerce. Most networking events through these organizations are free or only cost a minimal fee. If your business is a member of these organizations, take advantage of the opportunities they offer. Attend luncheons, networking events, and business expos. Don’t be afraid to invite other chamber of commerce members to lunch or to your business. 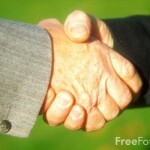 Reaching out to these individuals starts to build your “web” of business contacts. Once you meet enough people, your “web” starts to expand itself. Feather Communications will start its fifth year of business on January 1, 2012. While I have only advertised in a few publications, most of my business has developed from networking. In fact, this upcoming week includes meetings with three potential new clients that I have met through networking, meetings, and organizations. The best tip I can offer for networking is this: do it. You can’t talk about it, read about it, and expect it to happen. You have to actually go to the meeting, attend the after-hours event, and start meeting people. But, once you start to network with business professionals, you will be amazed by the results. Trust me – it has built my business for the past four years and I know it will continue to do so well into the future.